So close! Almost! Or maybe even done! Yes, you guessed right. 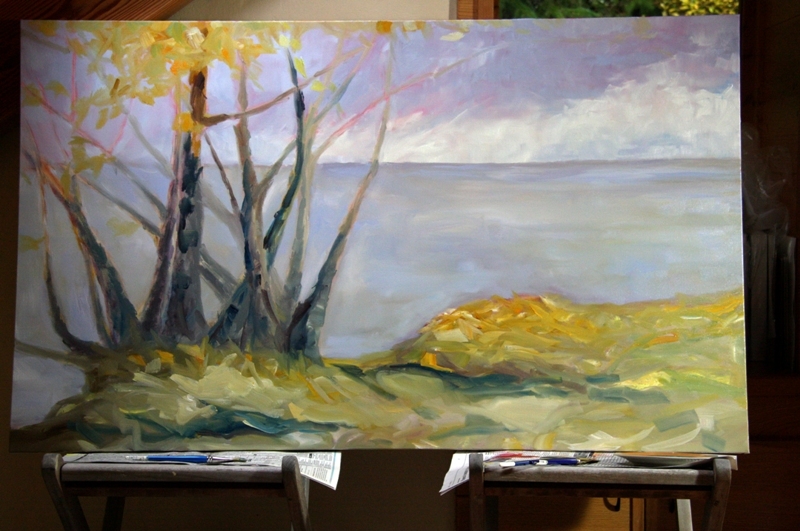 The latest 30 x 40 inch canvas of Sailing Through The Trees is “resting”. But, before we go to the end, maybe you would like to see a short video of part of the process along the way? Yes? I thought so. And so it went, for several days, until I came close to the finish line. Then, I swore! A couple of times! Which didn’t help at all, in case you are wondering. Back to the folder of video and photograph references for the umpteenth time. Then down to the actual location, looking, searching, feeling and taking more photographs. 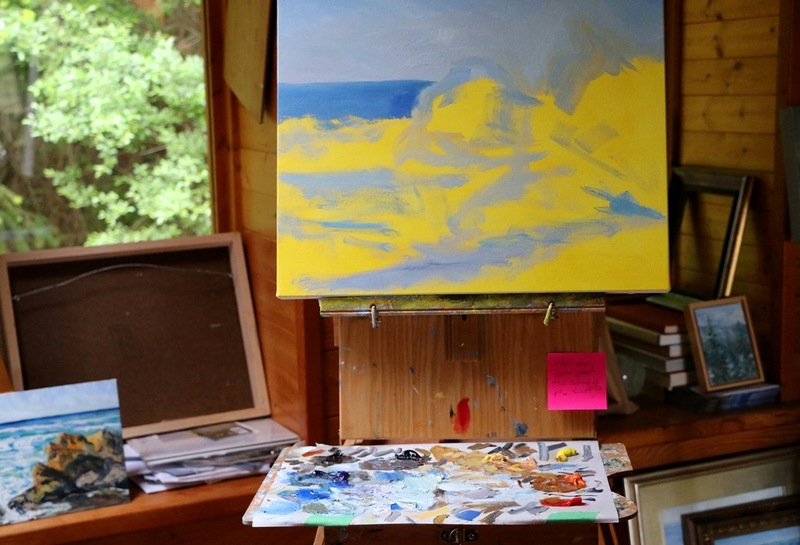 Back to the winter studio, pick up brush and apply paint. Three more trees are added. Other trees are moved around a bit forward or back. Specific branches are added and so on. Finally, the painting shifted and came together as a completed work with all the harmony and mystery that was intended…. well, except for “resting” but I doubt it will change much from here. Lets start with a few details and work our way up to the finished painting. and the lofty trees crowning the complete vista…. The painting will be set aside to dry and I will look at it over my shoulder while I continue working on the next painting. If, as time passes, I notice something that I just can’t resist changing, then there will be a flick of a brush loaded with paint in the appropriate spot. Most likely though, it will dry to the touch and be laid on its back to have the edges painted. So, no more swearing as I look upon this beautiful day beside the sea where it would be a dream to live! What are you almost ready to call done!? The earth turns and the sun comes up. The earth turns again and the sun goes down. This is one simple measure of a day. What time will it be tomorrow morning when the first light reaches the eastern side of the island? At about what time this evening will it be too dark to safely take the compost down the stairs and under the trees at the edge of yard without a flashlight? When will the snowdrops start to bloom on the southwest side of the house? What difference does a day make, or even a few hours? These questions are possibly best answered by trees. At least, this is what I am musing about today as I continue my inner travels. Last week I shared with you a large 60 x 40 inch canvas with a red ground. Now, on this most difficult week of racial profiling immigration orders in the United States and terrorist killings of Muslim worshipers allegedly by a white male in Canada, I shall take you through the development of this large painting to the point where it is resting. I mention these two disturbing horrific North America events because I believe no painter can control their brushstrokes against the influences from within their daily lives. I am no exception. I frequently use my painting to process of everyday life with conscious deliberate acknowledgement. But my end results do not often depict this struggle to make sense out of senseless acts. Instead, the canvases frequently conclude with a clear message of hope, possibility and resilience. I believe this is because our interconnectedness is the greatest gift that the landscape continues to offer me. I did have it in mind to simplify this painting and leave out the young fir tree on the bottom right and the old fir tree on the left. But the storytelling arbutus tree was having none of it. These trees need each other to create harmony and balance in their ecosystem and for that same reason they are needed in this composition. It would be a mistake to think that this ancient storytelling arbutus tree has survived on its own. Of course, I am not the first painter, nor will I be the last, who studies the trees. A week ago, I purchased an amazing book of new sketches discovered to be by the hand of one of my mentors, Vincent Van Gogh. The sketches have remained hidden for 120 years and have created all sorts of scholarly disputes and discussions about their authenticity since the book was published in November 2016. The author, Bogomila Wesh-Ovcharov, is a Canadian art historian and specialist in Van Gogh. She is also a good writer. The book, with its 65 actual-size sketches, makes for tantalizing study. One of the sketches in this book of four people in an olive grove has particularly captured my attention. 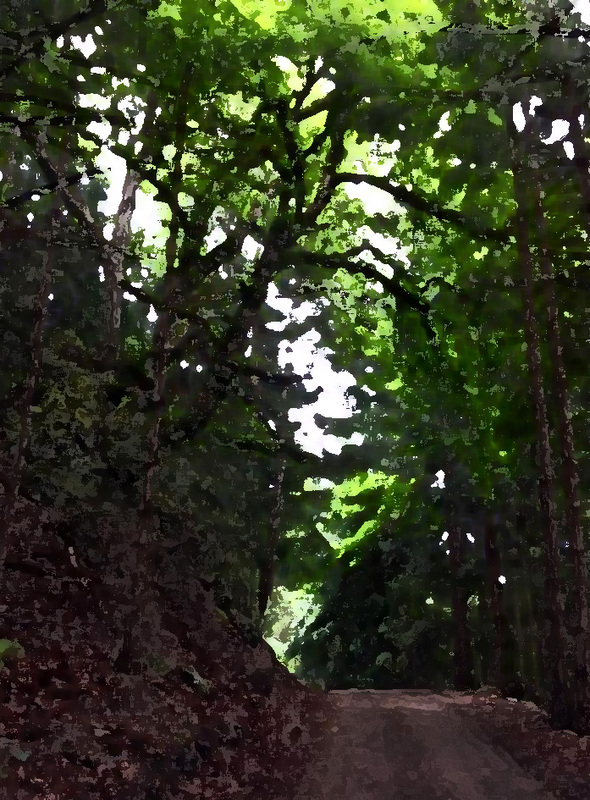 I am specifically reminded how in the past our daily work would often take us out into a forest or a grove of trees. 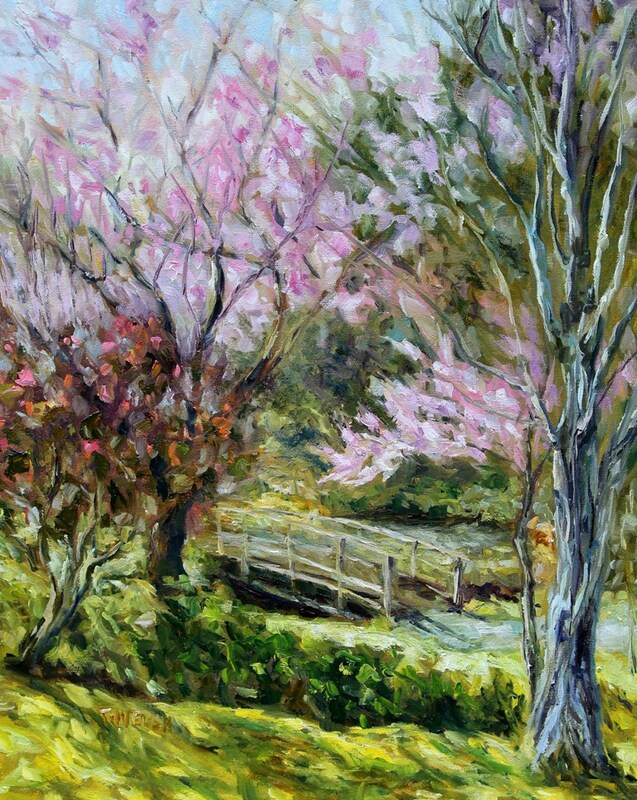 Currently for me, this connection is my daily walks or plein air painting to gather reference material for larger landscape canvases. But the relatively recent changes to urban living means my experience is a much more rare. In 1800, only 3 percent of the world’s population lived in urban areas. By 1900, almost 14 percent were urbanites. In 1950, 30 percent of the world’s population resided in urban centers. At times, in some locations this is still a routine practice. But for most of the 82 percent of urbanites in North America and 54 percent in the world, it is history, leaving large segments of our populations with no direct experience of their relationship between trees, and the landscape. These are the many individuals I believe who may have lost their ability to see the moon. Their lack of awareness, appreciation and understanding about our interconnectedness to trees, the sky, the sea and the land leaves them blind to the moon. For many our natural elements and our dependency on them for our well-being is an abstract concept, rather than an intake of breath with a thank you to a tree. For these individuals the moon is no longer there. I am guessing that with this loss comes another lost, the loss of knowledge about our interdependency and interconnectedness not only to trees but also to each other. In these conditions greed, fear and hatred can take root in the fertile ground of disconnect. 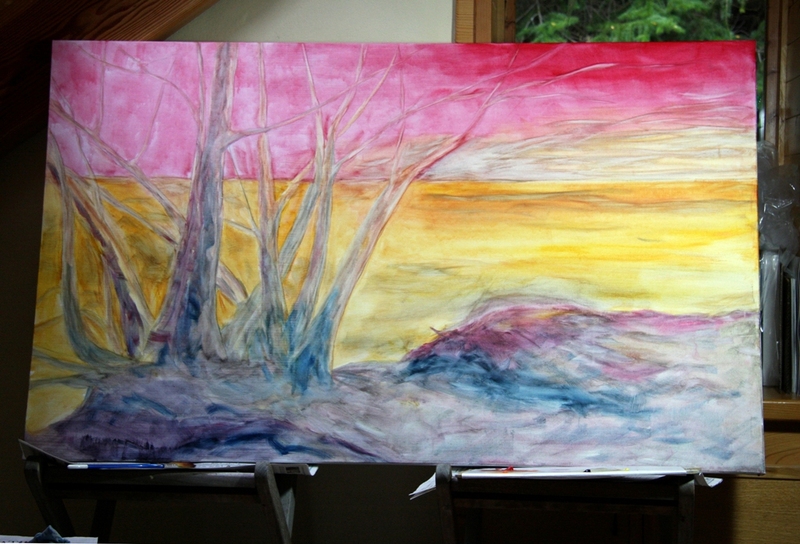 This is why I paint this grand storytelling arbutus tree on a large canvas in my home studio. 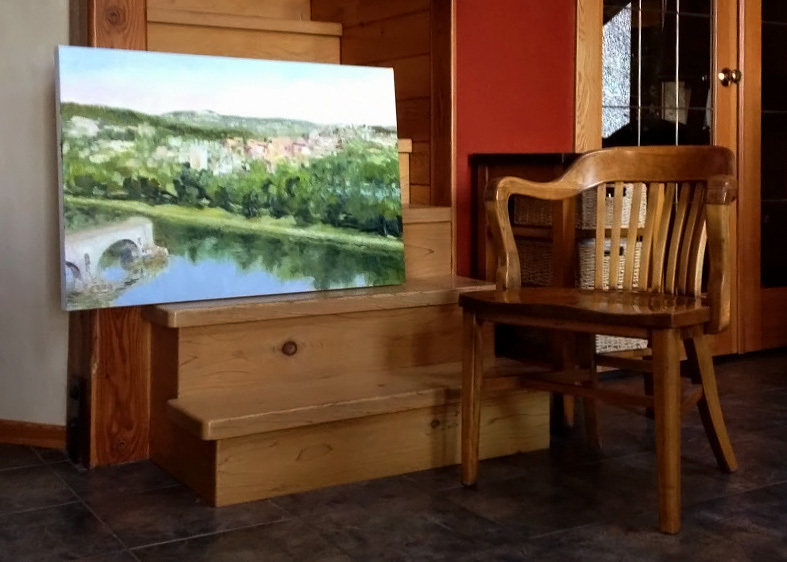 I am hoping that, when a viewer sees this finished painting, they will remember and experience their connectedness to all things in our natural world. They will again be able to see the moon, the tree and each other with kindness and appreciation. This is my wish anyway. It may be a naive and foolish wish but I must try. 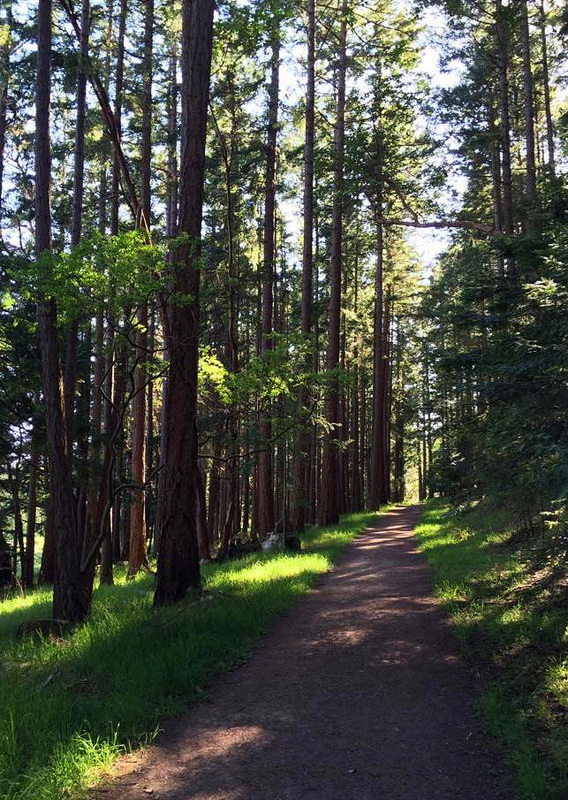 And no I do not think a daily walk in the woods will cure all the ills of human short-comings. I do believe it can do no harm and that it has a chance of allowing us to reconnect with our own goodness and act with care and compassion in the face of hatred and greed. The painting is not quite finished but it is close. Another couple of sessions with my brush and paints will see it complete. Here is where the painting is at this week. 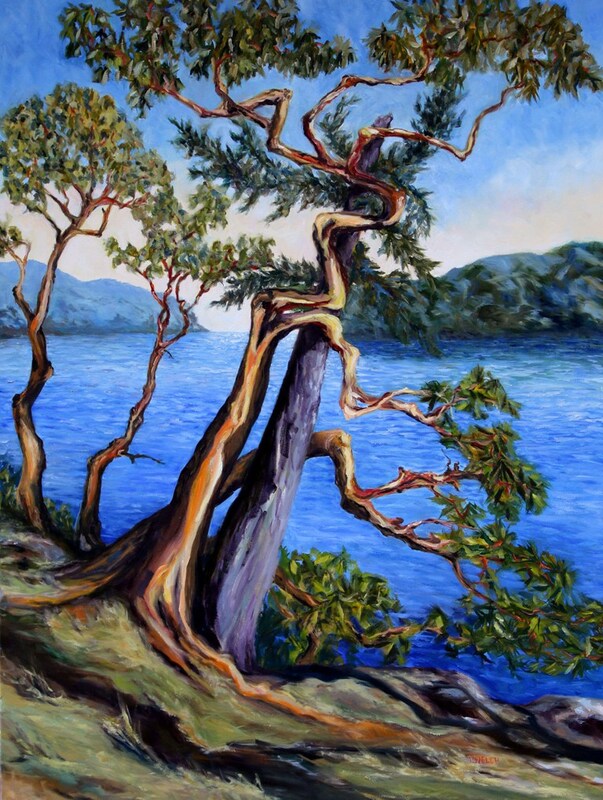 Resting “Storytelling Arbutus Tree Bennett Bay Mayne Island BC” 60 x 40 inch oil on canvas. 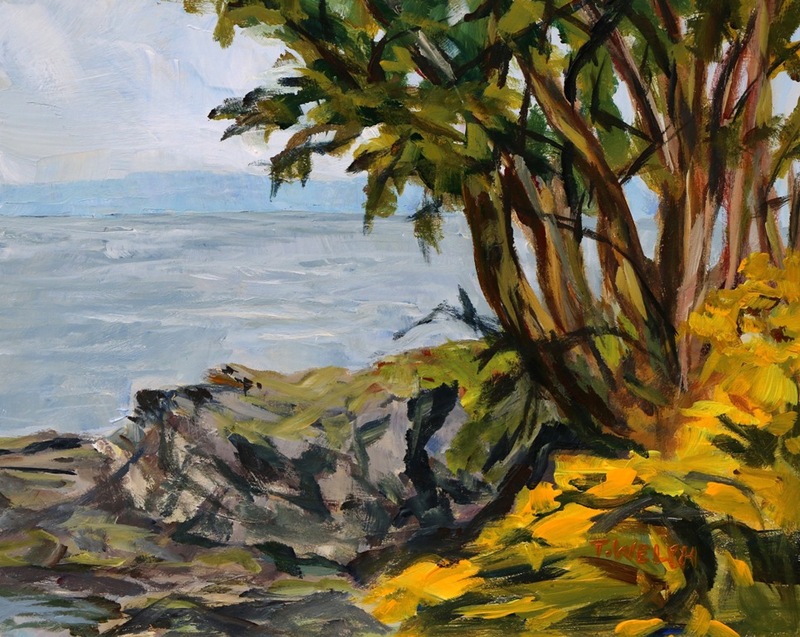 The next time we see this storytelling arbutus tree painting it will be released in a post on the website. But for now, we can enjoy our interconnectedness to it and all that is. We have in this an opportunity to build our resilience, to gather our energies in the face of possibly some of the most difficult times in recent history in Canada and the United States. This what I heard from the trees this week. Have you found a storytelling tree near where you live? If so, what is it telling you? A deer browses outside the studio window as I ponder how much easier it is to be in nature than it is to record being in nature. Since my last post many days have past. I am reminded of weaving and the over and under of life, living and my complex relationship to nature. Let see if we can pick up the pattern and weave it together. The rooster crows over top of the small forest birds as I try to decide whether to paint the third of three California surf paintings or write this blog post. The other two are complete and under review with other new work in the main part of the house. Canadian geese announce their departure as I climb back up stairs to the studio. 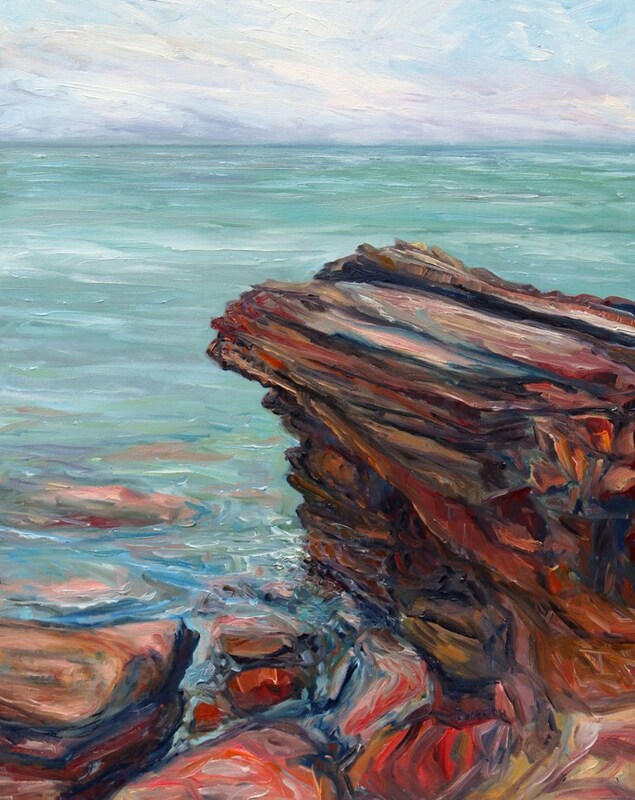 I am fixated on a painting problem and it goes like this – how does one paint the sound of the surf? 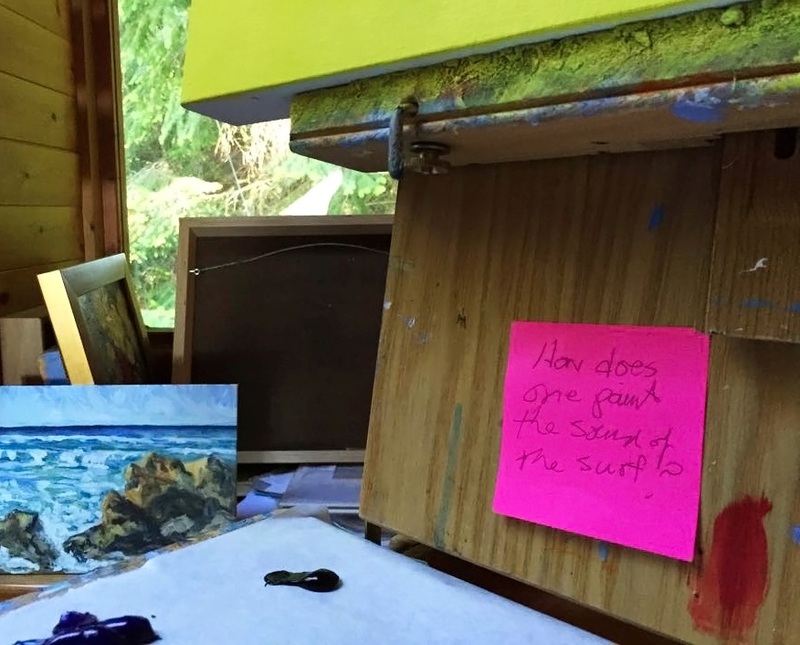 This problem about painting the surf took over following an Oregon and California road trip this spring. 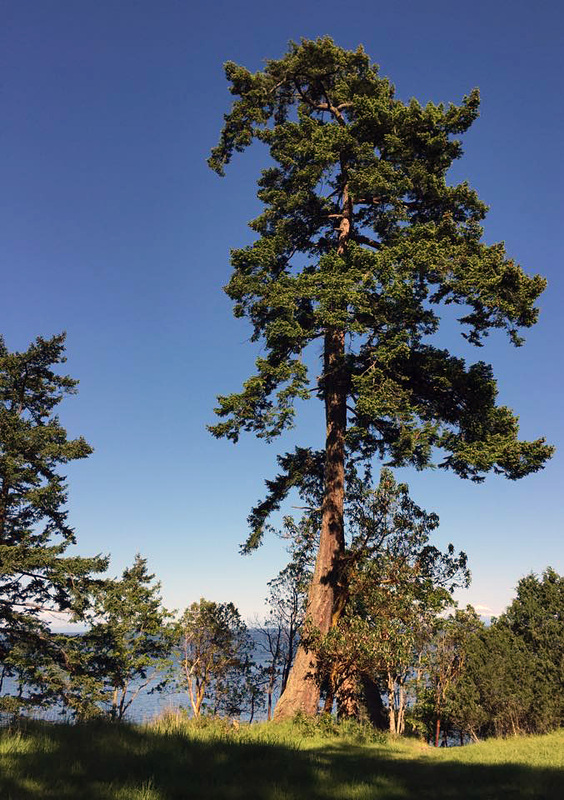 It has rooted itself into my consciousness like invasive Scotch Broom on Mayne Island – a beautiful problem but still one that there is a community desire to resolve. But Scotch Broom is an issue that is complex and not easily addressed. Practically speaking, both my painting problem and the broom take hard work as much as anything else to resolve. This is where #NatureIsCalling and the David Suzuki Foundation 30 minutes x 30 days in May Nature Challenge gives me a boost and possibly even a reason to sidestep the second issue – getting rid of Scotch Broom. If we propose that over and under is a repetitive motion that in weaving and nature never allows a person to return to exactly the same place twice, what have I discovered? 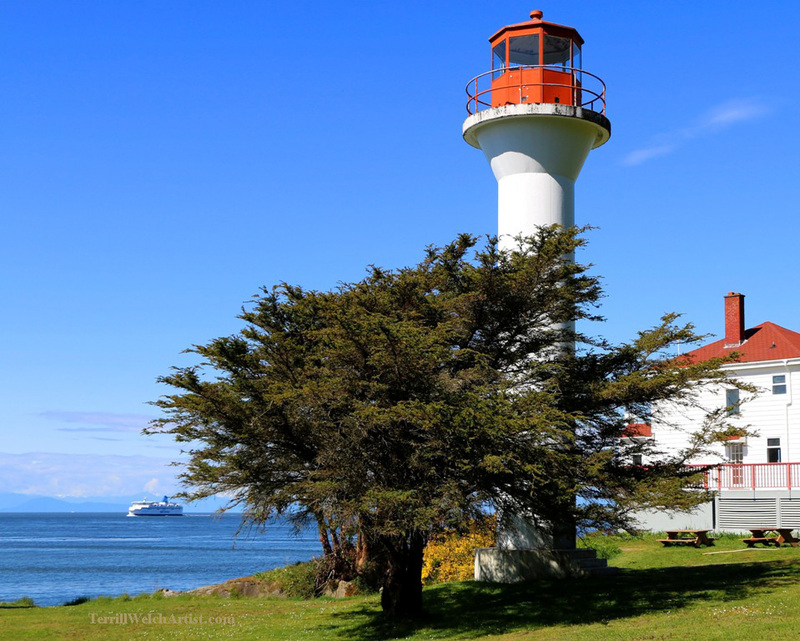 The Georgina Lighthouse park on Mayne Island is beautiful in the direct midday sun. or plein air painting in the early morning grey of heavy haze and cloud. We have come back again and again these past few days for picnics and reading. Sometimes I am distracted by the sounds of ferries entering or leaving Active Pass. But mostly, the seals and sea lions surface on the water and the seagulls and eagles call from the sky while I feel free to sprawl on the grass with nothing more to do than take it all into the core of my being – even the Scotch Broom. Scotch Broom you see is not really suppose to be here. The invasive shrub got away from gardens and has a habit of taking up any vacant space available regardless of who usually would be seeking residence – kind of like humans. 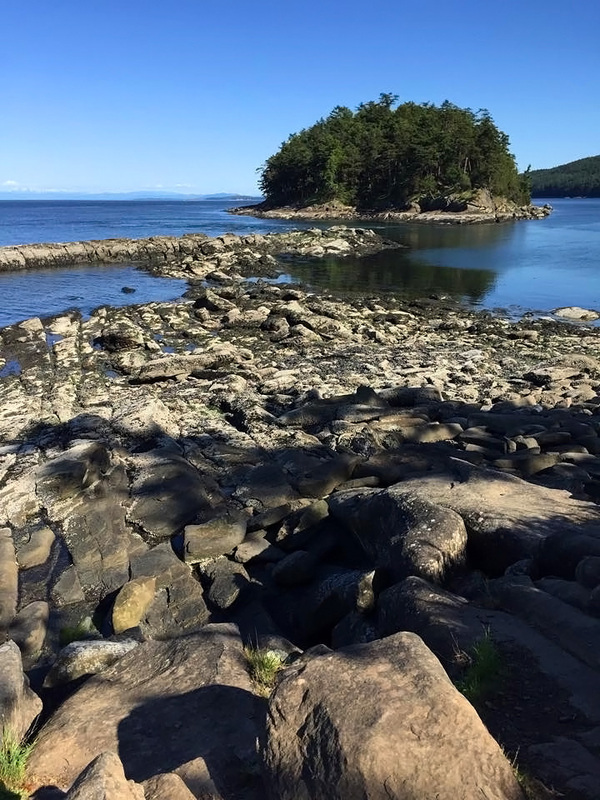 It has definitely made itself permanent on Mayne Island as it has elsewhere. The best way to keep shrub out is not to disturb the ground. This patch has developed due to shore erosion. It is a tough beast with deep roots. Possibly it is a natural solution to the erosion in this case. I am willing to entertain this idea for the moment anyway. By the way, if you look long enough and carefully enough there are two humans in this photograph sitting quietly looking out to sea. 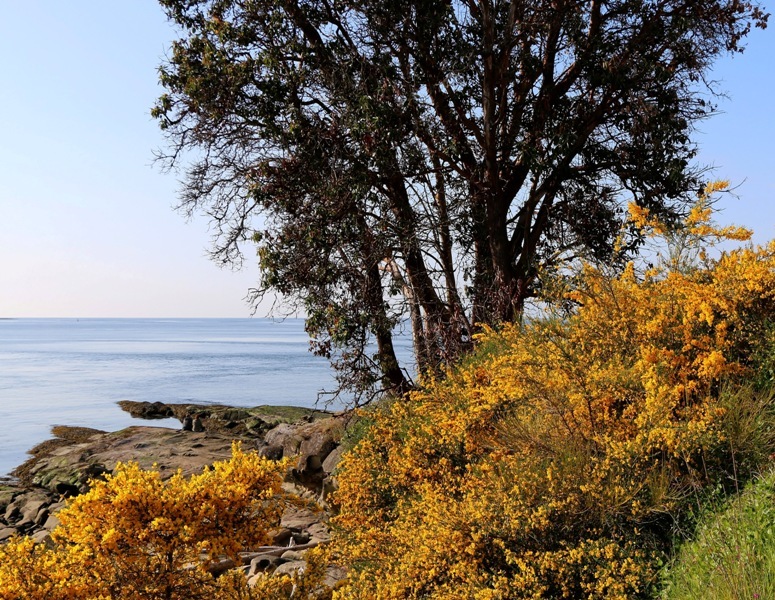 The lighthouse park is sometimes included in our longer walk each the day which are usually five to six km long and the same equivalent as climbing eight flights of stairs. These walks frequently include trails leading to and from the sea. or the strength of light, wind in the trees and patterns of roads sometimes are best understood in a painterly paintography fashion that catches my attention. These last four images were taken with my iPhone as it was all I had with me. My iPhone is sometimes a secondary part about being in nature. I leave my good camera at home in order to limit the distraction of framing images. It helps a small amount but not a lot. This habit of seeing light patterns and recording compositions is like a musician playing their daily scales on the piano – it is necessary practice. I would argue it is as important to my well-being as being in nature for its own-sake. I mean, how does one even come up with a crazy question about how to paint the sound of the surf if not from years of observation? 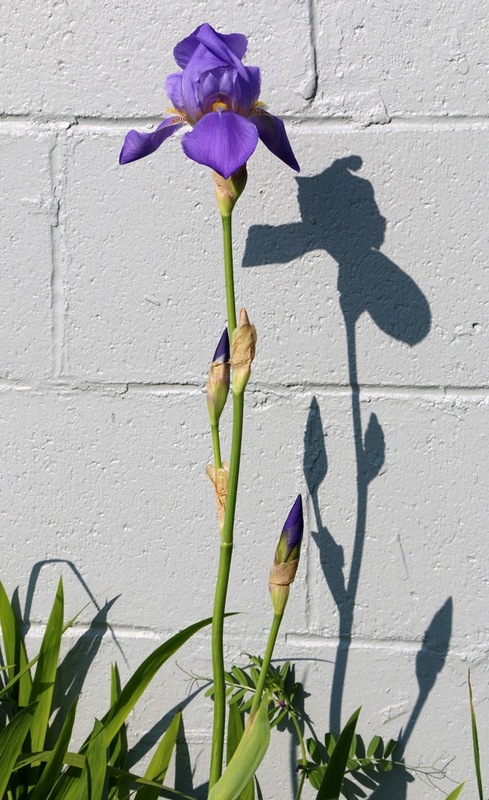 and a first Iris that hold my attention. It too is not native to this area. Like me, it is a transplant from someplace else. This close up is what I want to remember but it is not what I first saw in its raw awkwardness against the foundation of the lighthouse. What I have noticed during the past ten days of #NatureIsCalling is how good I am at sorting, sanitizing and sensationalizing what are ordinary, messy and complex experiences in our natural environment. While I think that what I am deeply aware of is that the sun on my shoulder, the rumble of the jet overhead, the rain in the garden, the rise and fall of my breath I also become aware of a world where humans want to be right and to be good. It is a world where human sharing uses the shortest route to what is considered best and worst, good and evil or right and wrong. Time in nature reminds me of the complexity of our daily lives by its examples. Maybe the time and energy to eradicate Scotch Broom is ill placed? My wrenched shoulder from doing this task a few years ago agrees – today anyway. 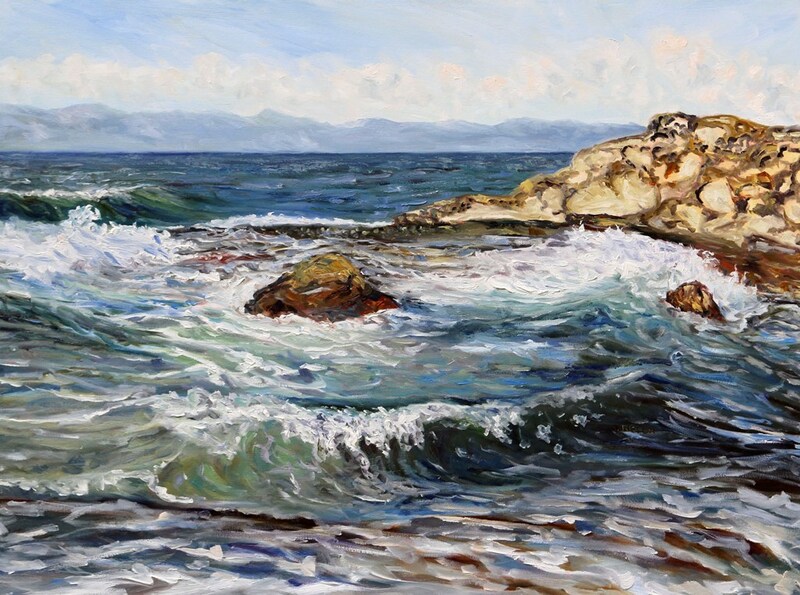 Now, I am off to paint the sound of the surf in my third of three paintings on the subject. 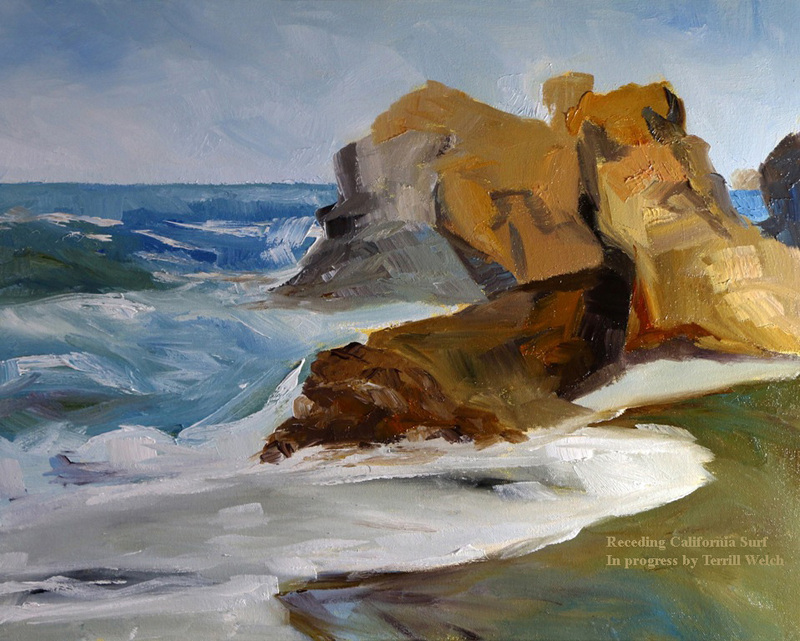 With a bit of luck, my next post will introduce all three completed California surf paintings. What complexities are you musing about? Note: #NatureIsCalling is the hashtag for the David Suzuki Foundation 30 minutes x 30 days in May Nature Challenge. 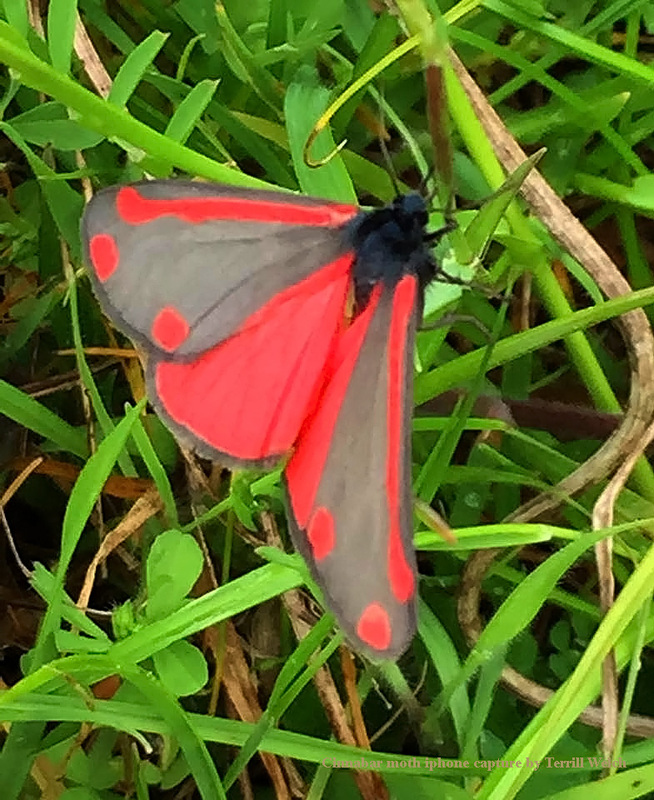 I am outside more than 30 minutes in nature each day as a matter of work and life style but I committed to being particularly observant for the Month of May. As time allows, I will share these experiences with you here on Creative Potager. 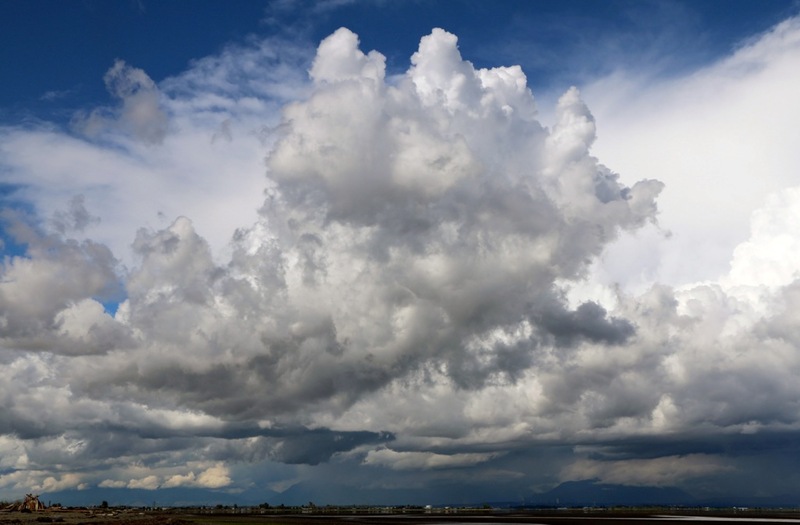 What is it that has us gasp in awe when we look across an expansive vista? I believe it is because we are able to find ourselves within a much larger context. We experience our relationship to our surroundings in a different way than when inclosed by trees or buildings. 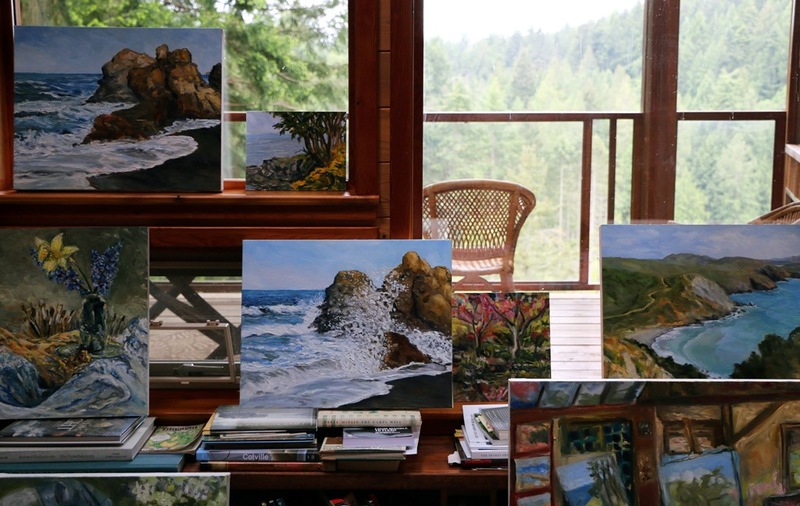 This experience is a challenge to capture in a painting or photography without separating the viewer from the view and leaving them standing outside of a landscape. You will know this from your own, sometimes disappointing, photography efforts when you say to yourself – but that wasn’t what it was like at all! 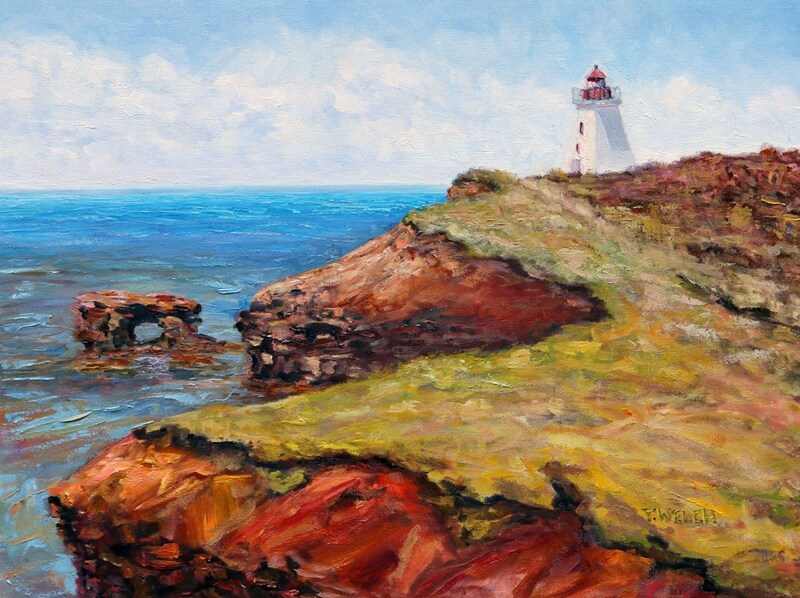 If you have been having conversations with me for a while, you know that I like to have my viewers experience my paintings from inside the landscape or seascape. 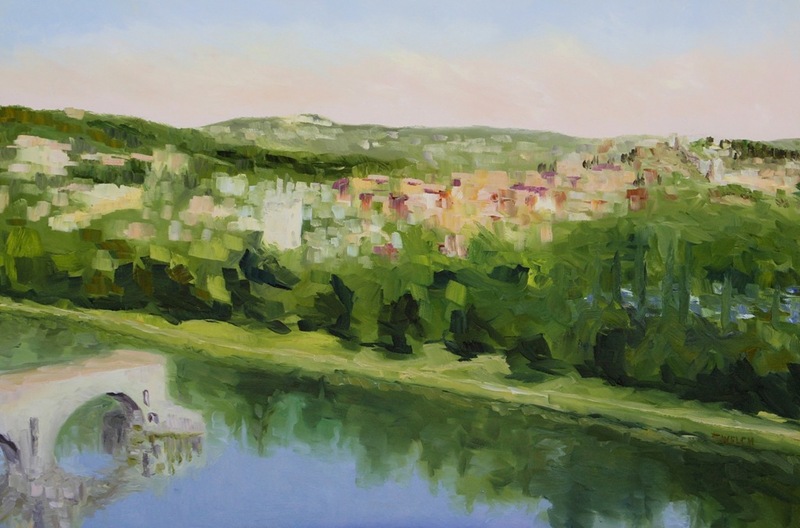 I believe I may have succeeded in this desire in my latest painting which has us looking down onto the Rhone River at Pont D’ Avignon and across the view to Villeneuve lez Avignon, France. Before I explain further let’s look at the painting and you can experience it for yourself. If you just want to experience the painting for its own sake I suggest that you read no further. However, if you are curious about what happened in this canvas please feel free to join me by reading the rest of the post. This is a good-sized painting so let’s look at it again with a bit of context around it. Even though the painting is harder to see at this second angle in the early morning light, it does give us a feel for its size and how it looks relative to its surroundings. This is the same idea as what viewing a distant vista does for us. In the second photograph I want to move around and maybe get closer for a clearer view. The same thing happens when looking across a valley. How many times have you walked out on a viewpoint and then moved from spot-to-spot to make sure you were viewing it from the best vantage point? I believe this action of searching is what keeps us inside a landscape rather than viewing it as a spectator. So you might ask – how did I attempt to replicate this exercise for just our eyes in the painting above? 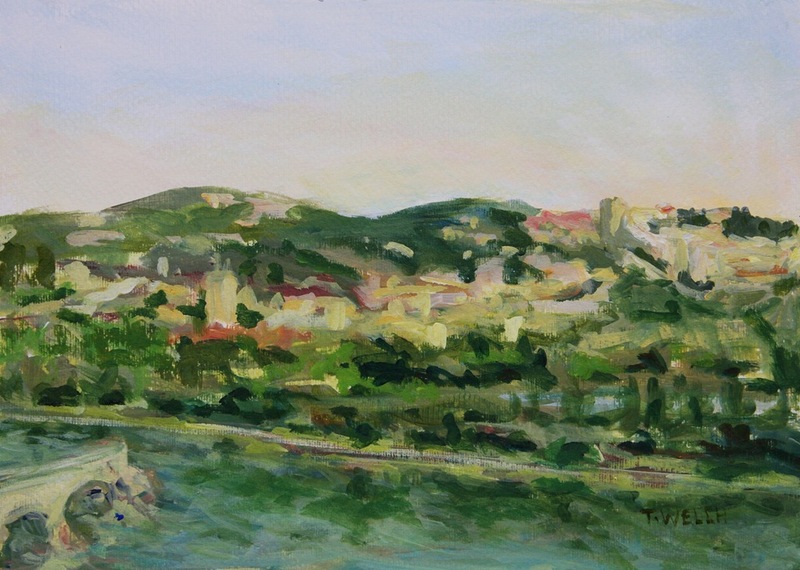 plein air 25 × 35 cm acrylic painting sketch on 185 lb paper. In the earlier post I talk about crunching the landscape slightly in my mind’s eye to fit the canvas shape. But now I am not so sure that is the only reason it was adjusted. 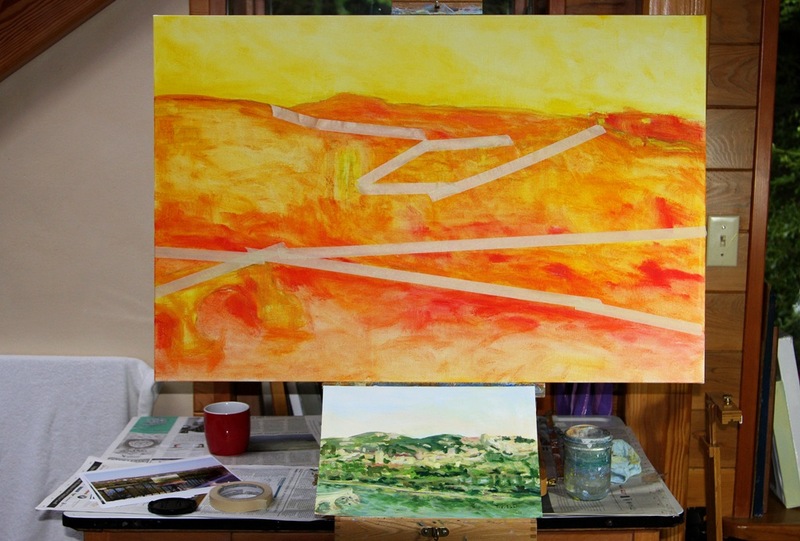 Let’s have another look at the underpainting with bits of masking tap marking lines of intersection and tension. If we look at the plein air sketch and the larger canvas these same lines of intersection and tension exist. Whereas in reality, if one was a surveyor and painted to measure this tension is stretched out much further. So what happened? I believe it is the process of walking around the vantage point for the best view. In doing this we gather information about the expanse and reconstruct it in our mind’s eye to provide us with the best view of all aspects. In this case, the elements of interest are brought closer together adjusted in size and clarity exaggerating the tensions and lines of intersection. The diamond shape of Villeneuve les Avignon is our eye’s anchor but we do not look at it closely do we? At least I didn’t. 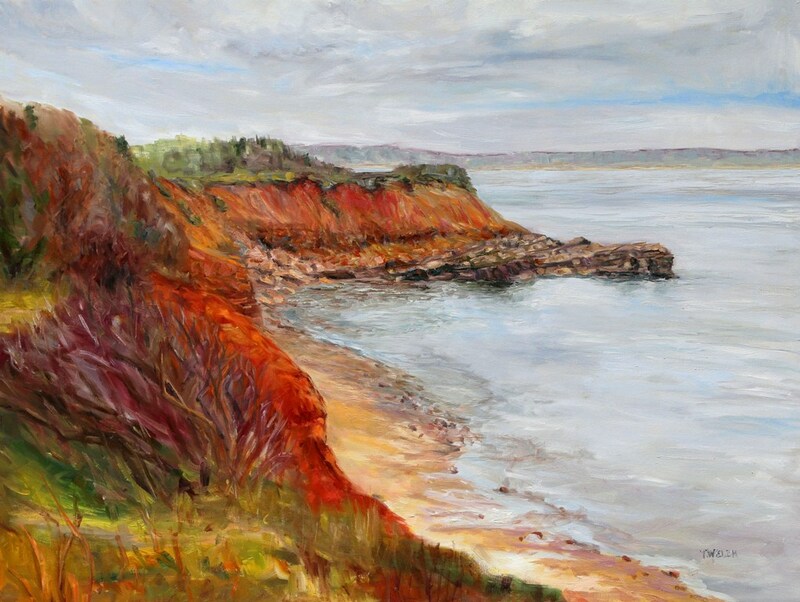 By having these conversations with myself while I painted I began to unravel how we can experience a landscape painting from inside of the view rather than as a spectator. The result is that the view is created as one might do for themselves if they were to be standing on the hillside gathering the experience in their own mind’s eye. We the viewer are therefore inside the painting through the intentional design and execution of the work. 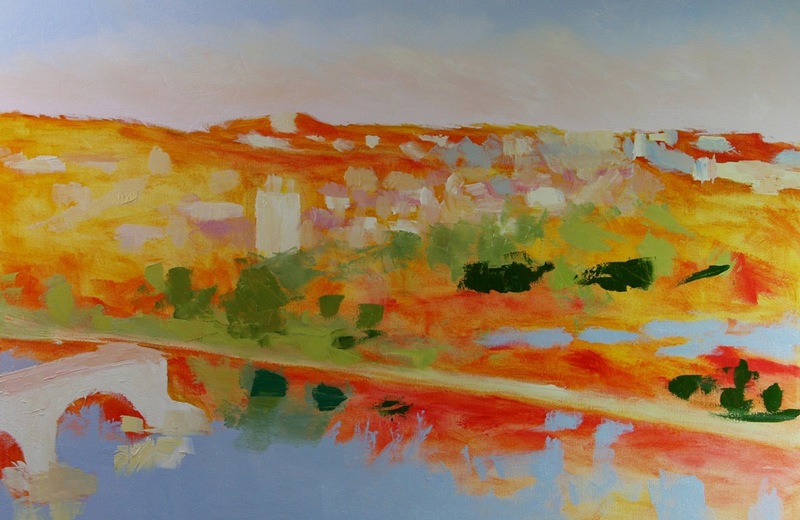 To do this I first had to understand the compositional intersections and tensions and then combine three different painting techniques from the realism of the arches on the bridge to the impressionism of the morning light hitting the trees to the abstract expressionism of the buildings on the hillside. 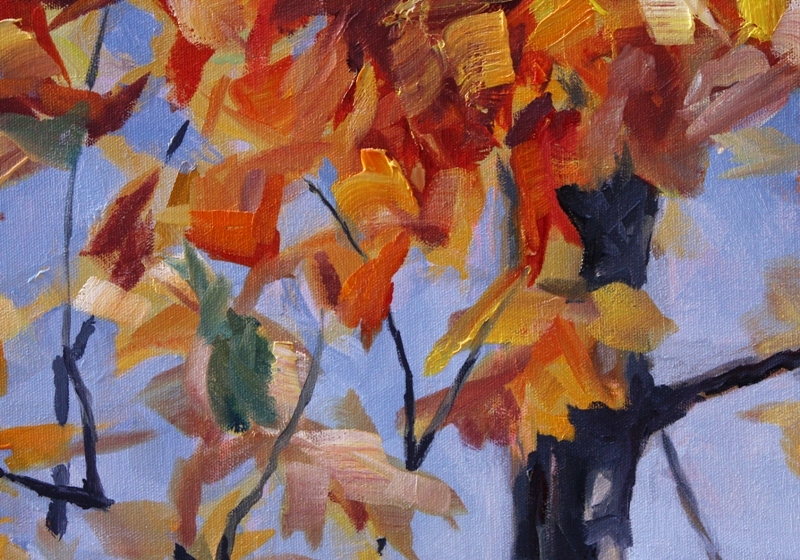 This combination of technique is not evident in the plein air sketch however. I developed this deliberate conscious use of brush and paint as I began working up the underpainting. I started to see the results though about here nearer to the end of the painting. I knew what I needed to do but I wasn’t sure I could make it work because culturally we have stripped these approaches into separate schools of practice. We have learned to understand paintings as if these are three separate painting languages. But from my recent visits through many European museums I find that artists are often multilingual. They will often find the perfect brush stroke using whatever painting language they have access to through their experience. 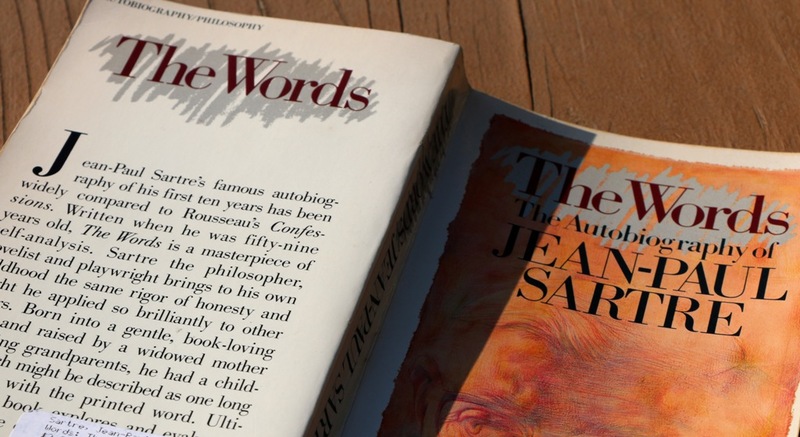 This separation of painting languages is to some extent the work of art historians generalizing major movements in art and our understanding of painting over time – which is directly influenced by our world experience as it intersects with our internal self. 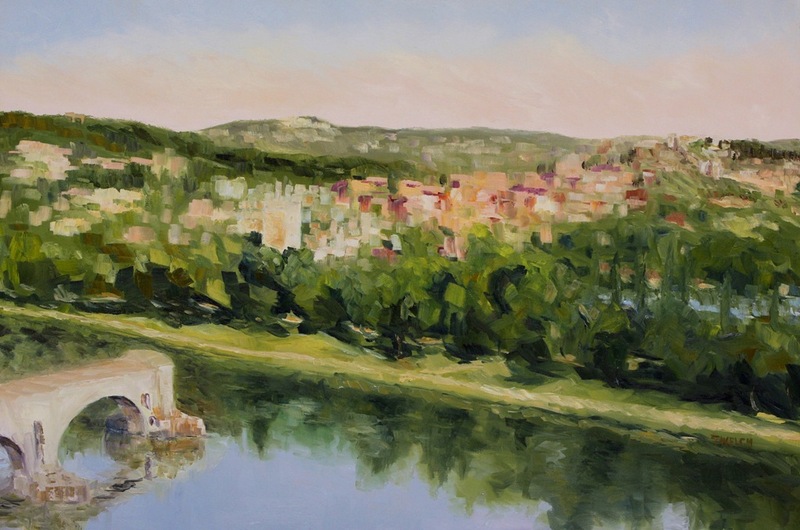 So I made a deliberate attempt to break these separation rules and stretch across as much painting history is covered by the Pont D’ Avignon itself. I wanted the viewer to view the painting as if they were standing on the hillside constructing the view within their own mind’s eye. This was much more important to me than conforming to painting schools of style and technique. 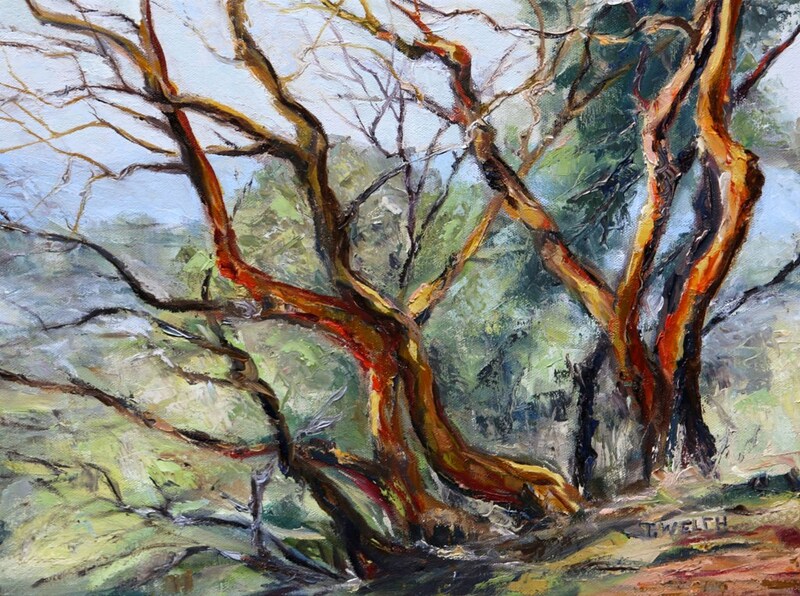 I think that the strength of this approach is evident if we revisit the plein air sketch and then final painting. 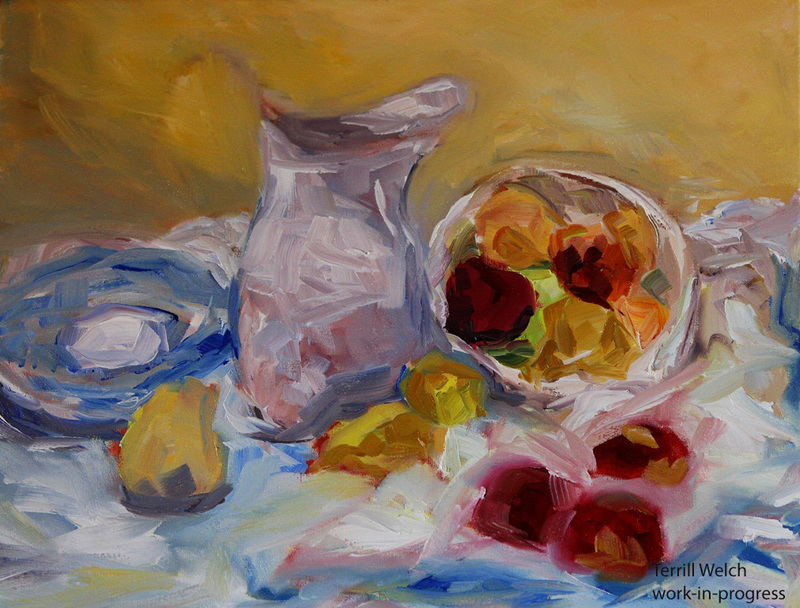 The same life and vitality of a quick sketch was carried over into the larger painting but the visual strength that the larger painting has is missing from the earlier painting sketch. At least that is what I experience. I would love to hear what you experience as well because the risk of mixing several languages of any sort is to be miss-understood. Can you tell us about a time when you consciously merged separate approaches or languages to achieve a desired result? 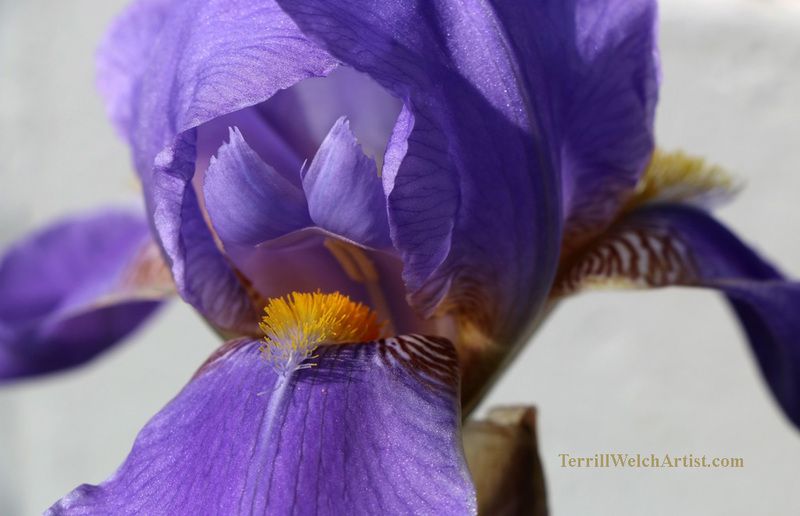 Until the end of December, my Monday morning posts are about noticing blessings and things I am thankful for receiving. Due to my schedule this week, I am posting on Sunday instead. What I am noticing is that I often take action when I am feeling blessed. 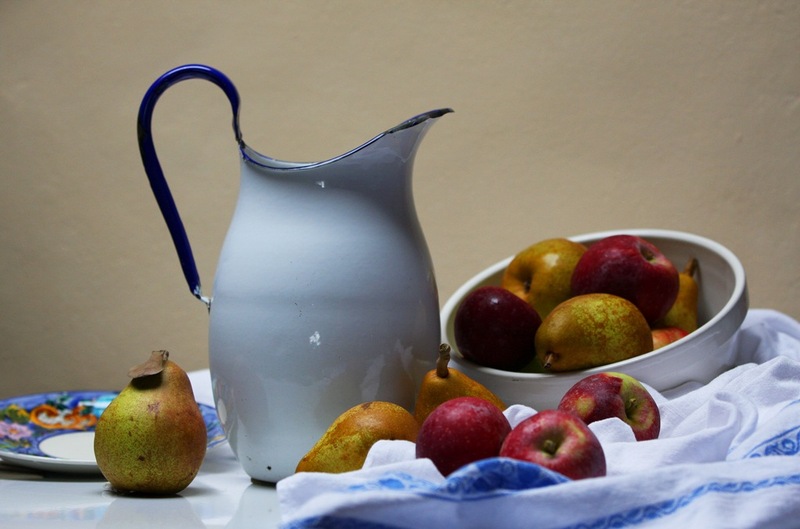 For example, I am thankful for the local apples and pears we have been devouring over the last couple of weeks. So good! In fact, good enough to want to put a few in a new still life painting. Image available for purchase HERE. 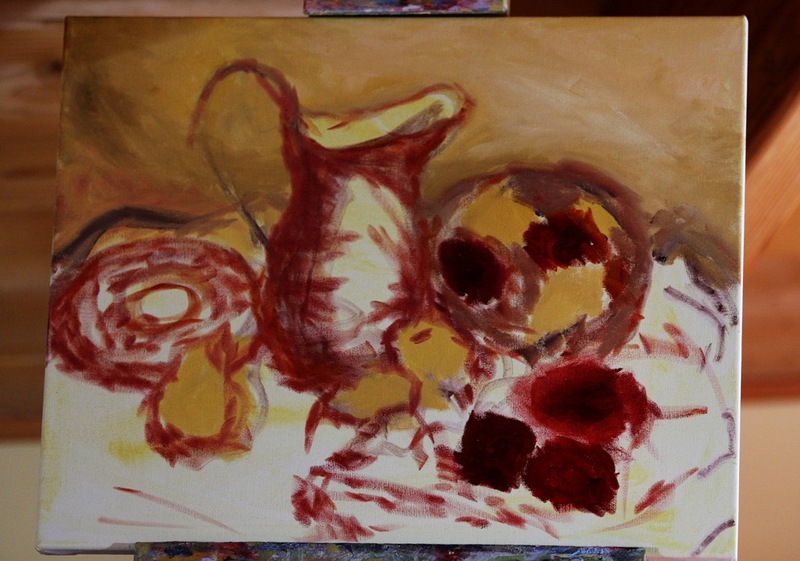 Now for the beginning of the still life painting. It is hard to see but the whole canvas has a light wash to tone down the white and then I just begin to find the shapes and colour relations not really worrying about the final result too much at all. Things will change and move around with time and light. The idea is just to get started somewhere. We now have a study of whites and how they are always leaning towards one colour or another. 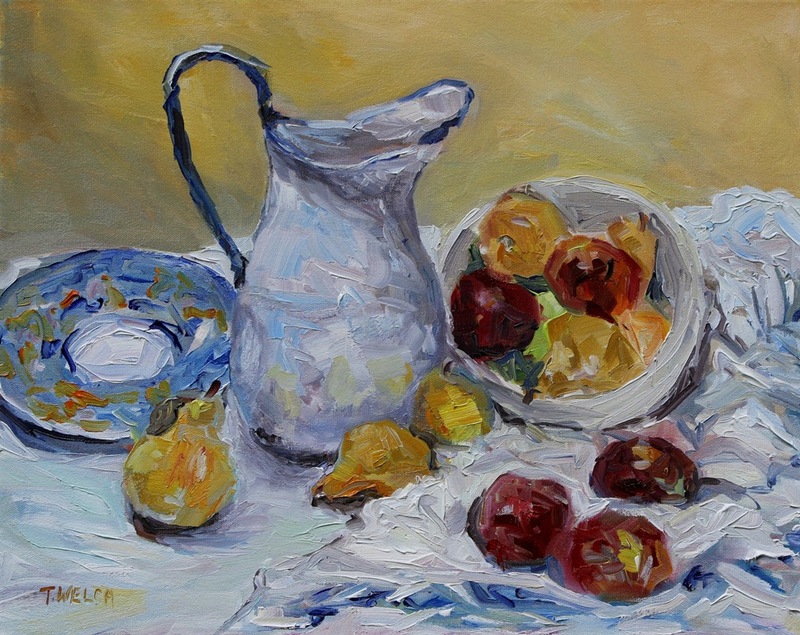 The tastes, smells and texture of this still life have slid onto the canvas. For this magic of creative process I am thankful. Some of the pears and apples have been eaten. The brushes have been clean and the paint on the palette is drying but it is all still here. May your Sunday be rejuvenating and bring a sense of awareness and comfort. What blessings do your actions tell you that you are noticing? 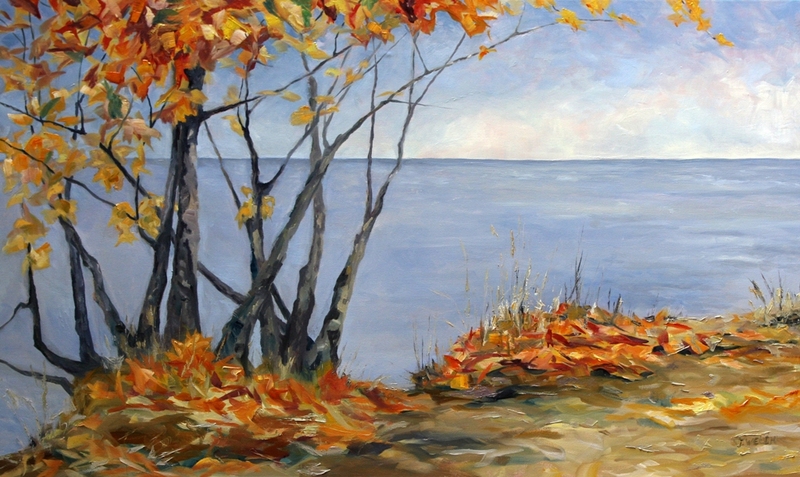 There is something about autumn by the sea with the gray melancholy wrapped in fall colours. 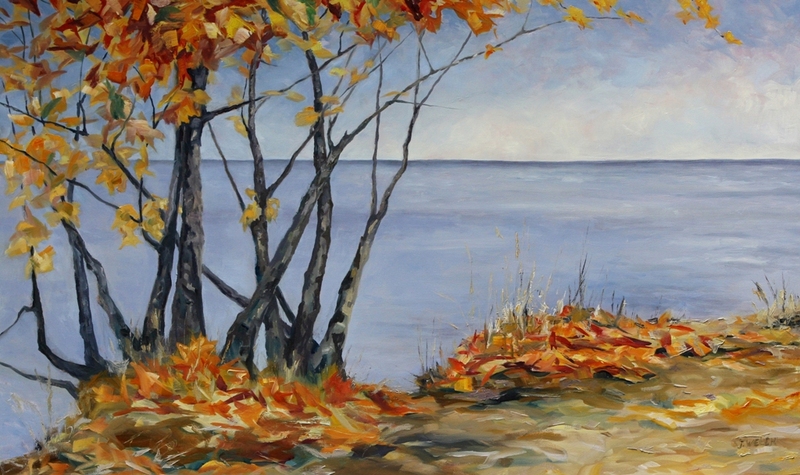 Do you remember my recent post called “Autumn Sliced with a Tear” and the photograph of the maple trees by the sea? For about a month I painted and repainted this scene in my mind – maybe a thousand times. I adjusted and readjusted my approach solving one painting problem and then another. 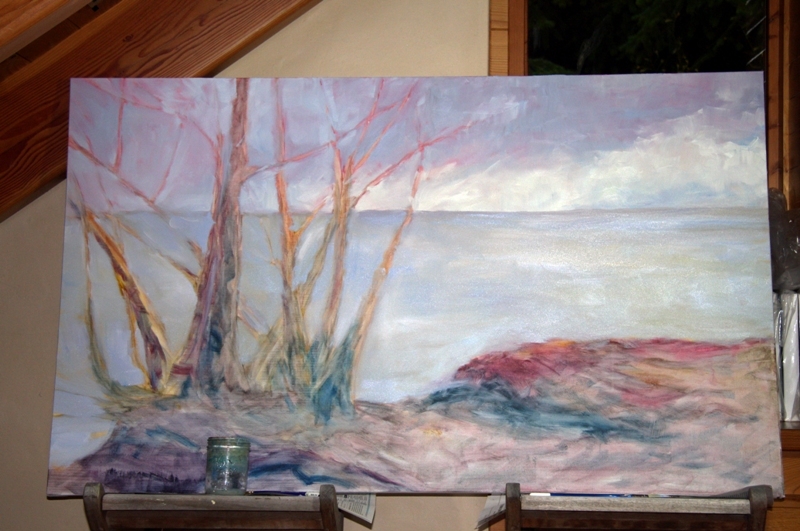 Finally, I pull out an extra-large 36 x 60 inch canvas (that is 3 x 5 feet or just plain BIG) and begin with the underpainting. The canvas is shiny with wet paint but I can already feel the bruised coolness of fall in the sky and on the water. I keep working and building up the paint. Days have now past with my dreams waking me up early to paint for many of my waking hours. I am consumed with the transitions between light and shadow and form. 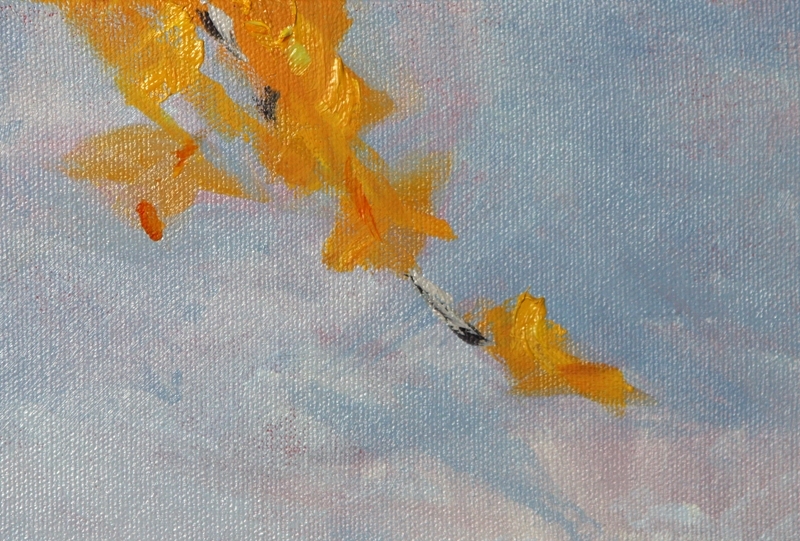 The details show the looseness of easy strokes with two and one inch brushes. There is the leaves against the sky on the far top right. Nothing but swathes of golden colour added to the sky with a hint of branches to hold them in place. 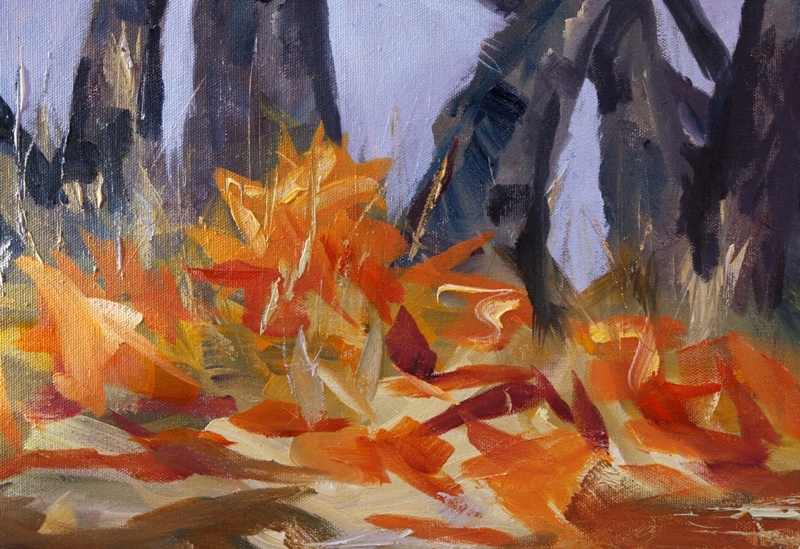 Then there is the clatter of colour near one of the main tree trunks a the top near the left side of the painting, colours that must roll over and under each other bringing the leaves forward in the painting towards the viewer. Up close, we see nothing but wild and loose, meandering brushstrokes across the canvas. I like to paint wet-on-wet or ala prima and work a whole canvas up at once. This is no small task on a canvas of this size. But it can be done though it is often not the only painting approached used just because of the grand scale of the canvas. 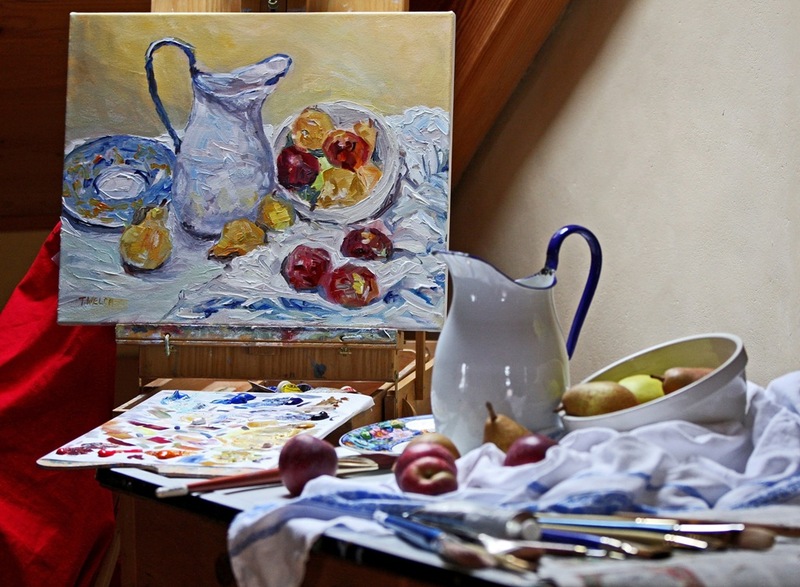 For example, even using this approach it took more than one sitting or painting session to complete this painting. Finally, my brush and the painting comes to rest. Let’s stand back and have a good look at the whole canvas and see what we find. I think it is complete, finished, done. 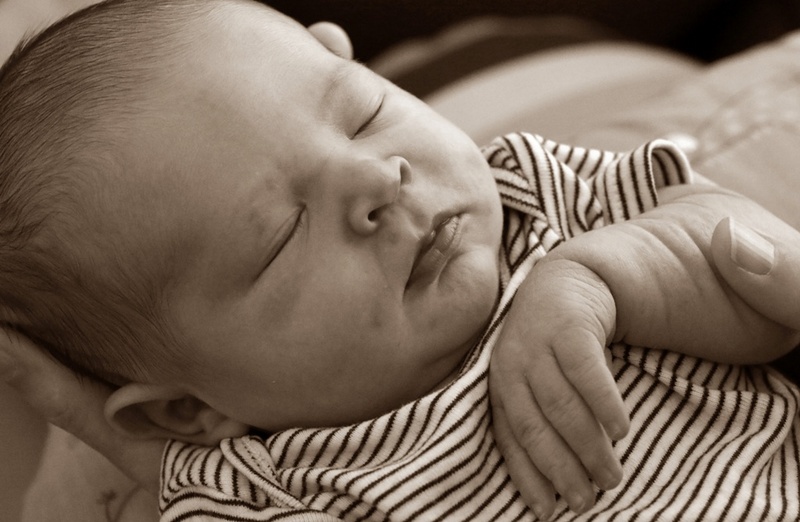 Now it must rest and I reserve the right to make any changes that come begging to me during this time. So it is not for sale yet. However, I will let you know when it is. In the meantime feel free to browse through current work that is available at the links below. It is not going to be released anytime soon for sale as I am keeping it in my Artist’s collection for now. Sprout: If you could be anywhere under a fall sky where would you want to be? P.S. This is an early warning that Creative Potager will be making some changes in the New Year. They are not big changes but ones that I hope you will welcome as I re-purpose the intent of this blog to reflect the changes in my own focus of providing an online studio experience of work for readers. More on this soon.